As OnFiction readers will know, we have from time to time demonstrated a certain editorial affection for travelogue. Professional geographers also have a strong travelogue tradition--and a rather parallel tradition of field guides and guidebooks: stories of places visited ahead of time and reported back to travelers who might follow. Orientation to places through such field guides produces a particular narrative experience. Desiring guidance, travelers turn to guidebooks' accounts to guide their experience of places not only when they face the prospect of travel, but also like they might turn to literary criticism--to enrich the schemata that organize the conceptualization of places and spaces. The usual format of both field and travel guides suggests that they are rather more like encyclopedias than like stories: lists of places or sites one might visit, with glossing about the highlights--much more catalogs of settings than narratives with characters and plot. One might consider that even if the places or place features of guides take the place of characters in stories, they are still too lacking in plot to be considered as something we might recognize as a story. However, even in the most encyclopedic formats (and certainly in the form of travel guide that hybridizes Frommers and Under the Tuscan Sun), narrative form is suggested by methods that demonstrate some of the ways that readers' emotions are enrolled in producing experiences of stories. Some of the more obvious methods are in the sequencing and narration of travel highlights. Structuring an itinerary around a series of predictable high points helps prime a reader or traveler for particular experiences, not only in terms of appropriate preparation and anticipation for experiences to be had and transitions between them, but also in relation to the unexpected experiences of travel or exploration. The proportion and framing of such unexpecteds in relation to predictable events appear to be, in fact, some of the significant qualities determining guides' price points, with "budget travelers" or adventurous field explorers expected to want a higher proportion of information about setting (think very detailed bird guides here) and less prompting about how they ought to respond to the setting (in contrast, particularly, to the most narrative style of guide, modeled after books such as Peter Mayle's A Year in Provence). One of the implications of the prefigured adventure format is the grappling with plot and character in which the reader / traveler must engage to form an actual experience. Each reader gets to figure out his or her own plot of activities and emotions, but each factual bit of advice is likely to also come with expectations of reactions and performative schemata. Even field guides, which seem at first much less prefigured, proffer considerable pre-ordering of experience, with normative assessments of the value of and proper response to the domain in question. 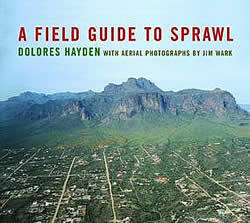 The image above is the cover of Dolores Hayden and Jim Wark's 2004 A Field Guide to Sprawl. New York: W.W. Norton and Company. Thank you very much Valentine, for this. I suppose I am the most frequent perpetrator of travelogues in OnFiction, and I hadn't thought sufficiently about the idea of them conforming to a narrative schema. But you are exactly right. I suppose in my travelogue pieces, the two components I go for are, first, as you explain, something informative, that might be of interest to a traveller, and second something droll. The droll part, when I am thinking and writing about it, is really a moment of reflection, such as in ordinary life can pass me by. When I am travelling, such a moment can come into focus, so that I can, then, reflect on a certain kind of experience, write something to catch the moment and let it expand in the mind.